You’d imagine that a company called Mellow builds gentle retro roadsters, or laidback cruisers for old-timers. But that couldn’t be further from the truth. Mellow are based in Obersulm, a small town in the state of Baden-Württemberg. It’s an area with a rich automotive history, being home to famous names such as Daimler, Porsche and Bosch. Some of that history is obviously flooding through the veins of the chaps at Mellow, and news of their abilities has spread across the English Channel. 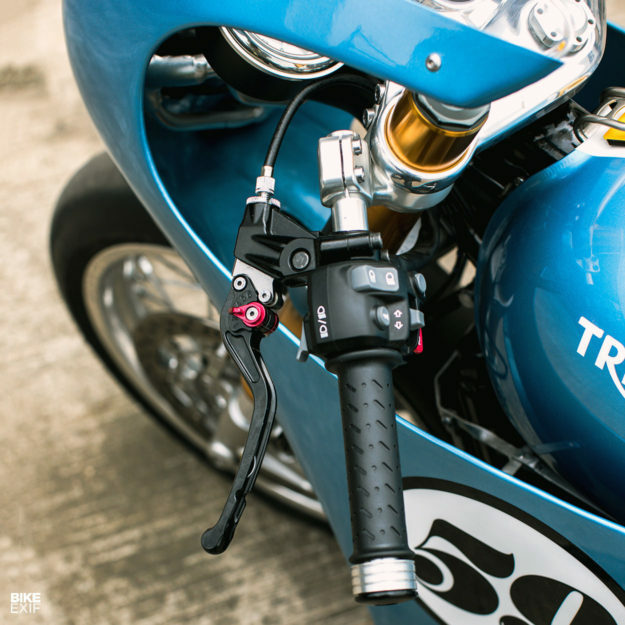 The regulations call for two cylinders and water-cooling, so Mellow started scanning Triumph’s Modern Classics catalog. Triumph wanted to celebrate their ‘Spirit of 59’ campaign, which harks back to the launch of the Triumph Bonneville series. 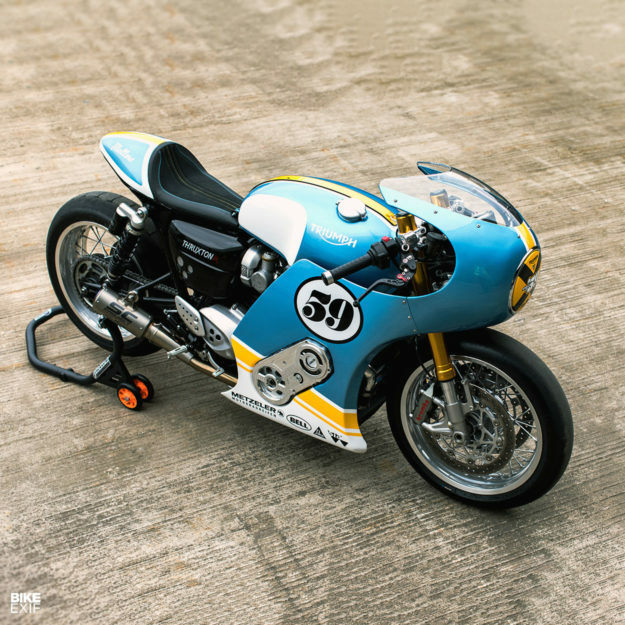 So Mellow decided to mix high tech supercharger engineering with an old school fairing. 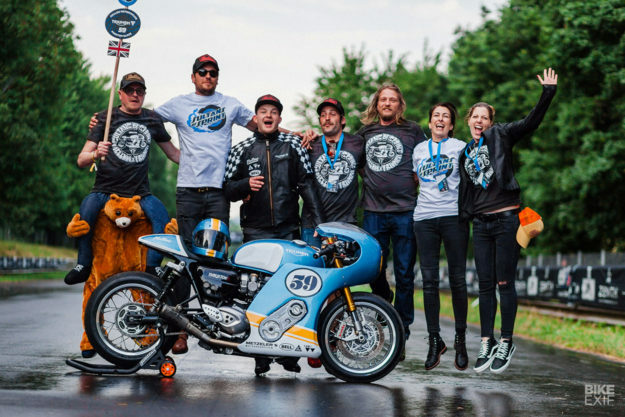 Flo and the Thruxton went to Triumph’s Hinckley factory to plumb in the supercharger with the engineering team. 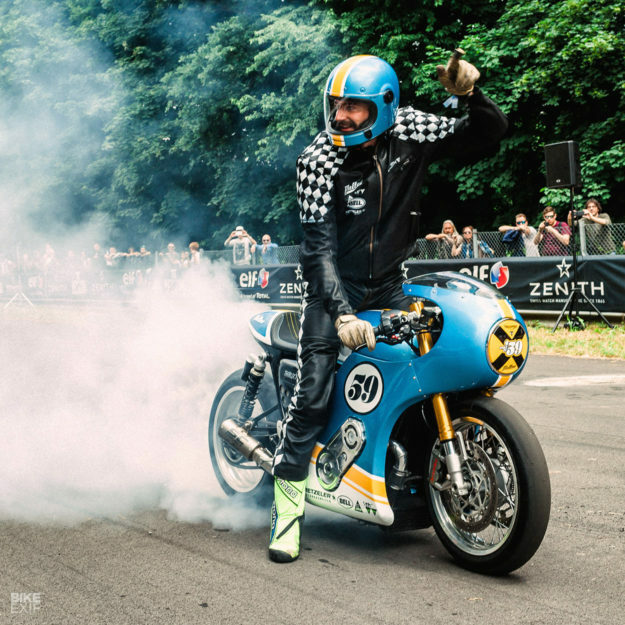 And since ‘Phantom Blaze’ is due to take its place in Triumph museum when the Sprint series finishes, Flo was happy to create a fully handcrafted metal fairing from scratch—even though it took almost 300 man-hours to build. The supercharger is a Rotrex C15-60, a compact model that supplies 0.6 bar (9-10 psi) of boost. Bigger injectors were also added to the engine to increase fuel flow, plus forged pistons to stop the internals imploding. An extra oil cooler keeps temperatures down. 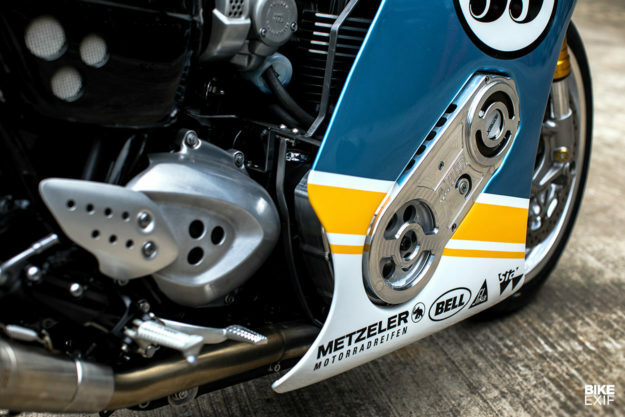 Gases now exit via a big-bore exhaust system with an X-pipe and free-flowing custom mufflers, specially built by the MotoGP specialists SC-Project. 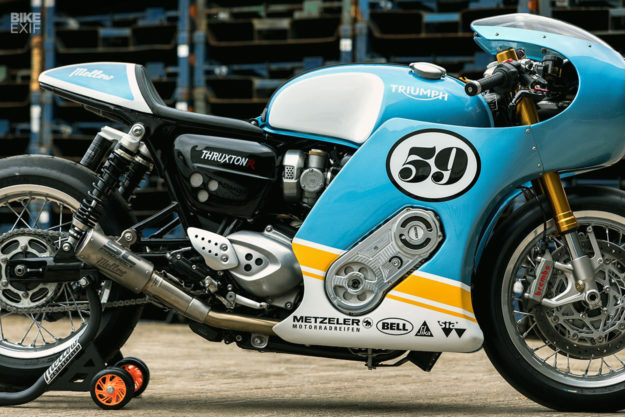 A custom ECU ties all the mods together, and after a spot of fine-tuning on the dyno, the Thruxton was sending a solid 147 horsepower to the back wheel, up from 96 on the stock bike. 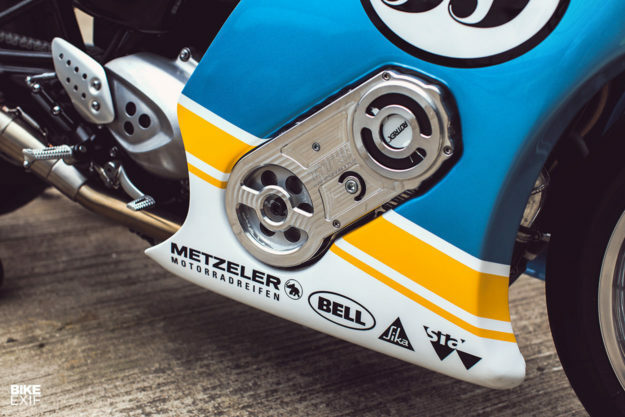 Mellow then created an 8.5 cm extended swingarm, CNC-machined and forged for strength, but maintaining the style of the original. They also lowered the front suspension and added Wilbers shocks at the back, to help keep the nose down when the supercharger spools up. Grip is now supplied via a set of 17-inch Racetec Supermoto slicks from Metzeler, and there’s a reinforced clutch to soak up the punishment. With the mechanicals nailed down, Mellow turned their attention to the bodywork. 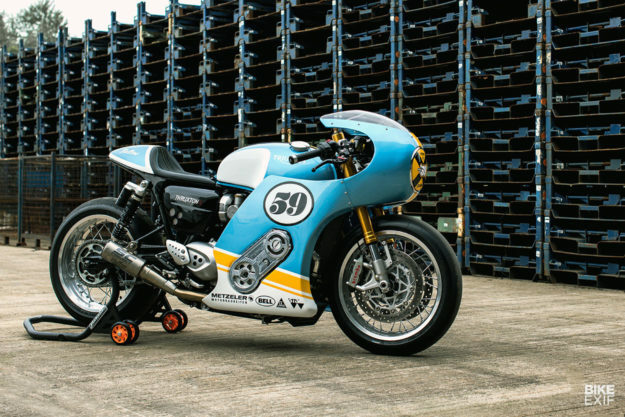 The slippery front fairing actually uses the Thruxton R’s stock headlight, plus the screen from Triumph’s own optional Café Racer Fairing. A Low Handlebar Kit was also lifted from the accessories catalog, and then the metalworking commenced. The new fairing is matched to a racy seat and tail unit, upholstered by Tailor Leathers—a moto specialist from southern Germany. 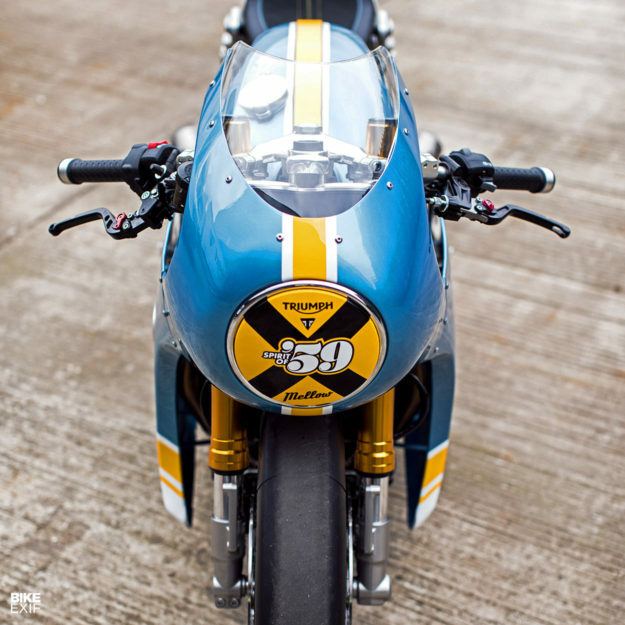 With gorgeous blue and yellow paint, the Thruxton R looks every inch the racer—and race it did. Mellow came third fastest in the opening Monza round of the Sultans of Sprint. But with extra points added for style and after-race partying, they now lead the table in the Factory Class. 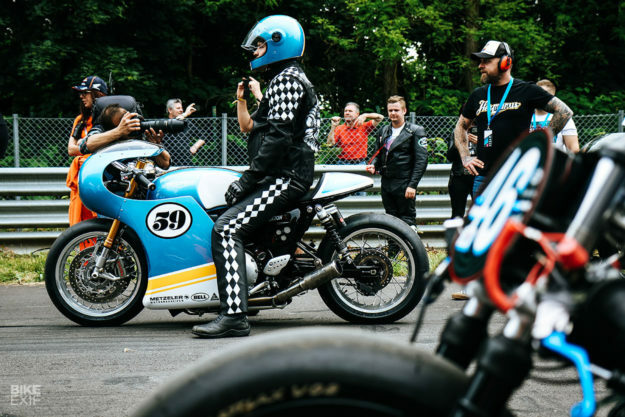 The next round is at the Biker Classics, held at Spa at the end of this month. If you’re lucky enough to be attending this amazing event, keep your ears open for the sound of a supercharger—and a blue machine streaking down the strip.